George Orwell is one of the world’s most influential writers, the author of Animal Farm and Nineteen Eighty-four and his eyewitness, non-fiction classics Down and Out in Paris in London, The Road to Wigan Pier and Homage to Catalonia. George Orwell was born Eric Blair in India in 1903. 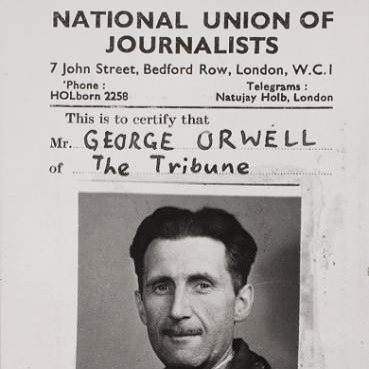 He was born to a comfortable ‘lower-upper-middle class’ family and a father who served the British Empire (Orwell’s own first job was as a policeman in Burma). By the time of his death in 1950 (and since), he was world-renowned as a journalist and author: for his eyewitness reporting on war (shot in the neck in Spain) and poverty (tramping in London, washing dishes in Paris, visiting pits and the poor in Wigan); for his political and cultural commentary, where he stood up to power and said the unsayable (‘If liberty means anything at all it means the right to tell people what they do not want to hear’); and for his fiction, including two of the greatest novels ever written: Animal Farm and Nineteen Eighty-Four. His clear writing and political purpose have inspired and influenced countless journalists, authors and others, of all political persuasions and none, in the generations since. We hope he can do the same for you.